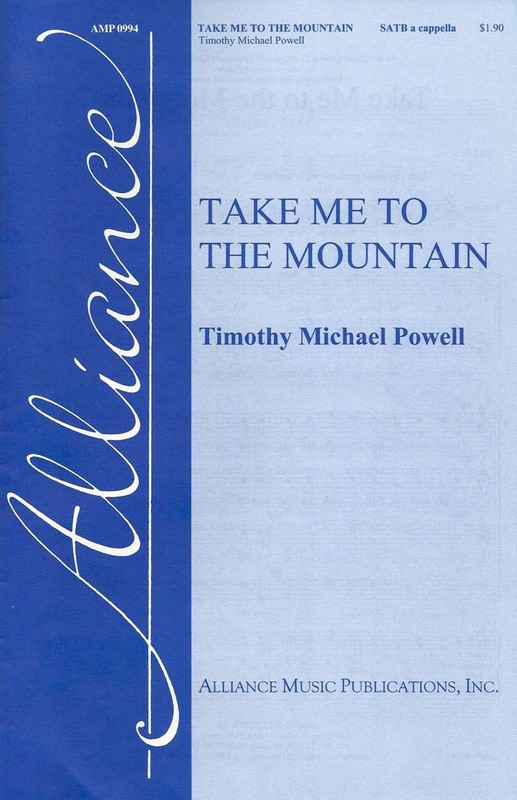 Take Me to the Mountain was written for the Chapel Choir of St. Augustine's Episcopal Chapel on the campus of Vanderbilt University, Nashville, Tennessee, and was premiered there on Ascension Sunday 2000. It is intended to be sung with joyous enthusiasm and with a rhythmic vitality which embodies the transformation, vision and resurrection celebrated in these bibical texts: 2 Kings 2:11; 2 Corinthians 12:2 and Acts 1:9–11. Though the soprano solo may be sung as written, soloists are also welcome to add something “personal” to the performance. It would be acceptable to have the soloist rejoin the choir ad lib on the final coda, perhaps singing the high note at the end. The coda should build in excitement with each repetition. If needed, the director may add a few more repeats once the entire choir has entered, and movement and clapping would not be out of place.